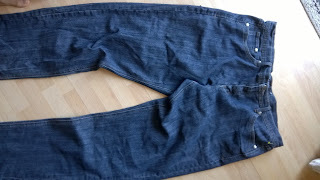 Refashion Co-op: "In my former life...I was a pair of jeans!" "In my former life...I was a pair of jeans!" The skirt was a little shorter than I like so I didn’t want to turn it up, and I didn’t have enough scraps to make a border, so I just stitched a couple of lines, washed it, and frayed the hem. I love the skirt! You did a fabulous job. If I had my way, I would wear sweatpants and a tee all day every day. But I don't mind wearing skirts every now and then.